Gainesville celebrates May Day | Fight Back! 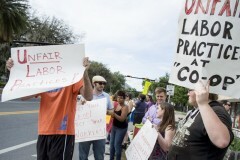 Gainesville, FL - About 40 people gathered at the Civic Media Center, May 1, to support fired members of the Citizens Co-Op Workers Union and celebrate International Workers’ Day with BBQ and live music. Several different groups helped organize the event, including the North Florida Central Labor Council, the Alachua County Labor Party, UF Students for a Democratic Society (SDS), and Freedom Road Socialist Organization (FRSO). The event started with a picket outside the Citizens Co-Op, which barely a month earlier fired seven workers for attempting to start a union. The protesters held signs stating, “We support the union,” and “My money and I support the workers.” The fired Co-Op workers and supporters had been picketing for the past couple of weeks, and it was important to show solidarity for their cause on International Workers Day. After the picket the protesters and community allies headed inside the Civic Media Center for food and music. There were different tables set up by the organizations that helped put together the May Day protest and festivities. In between music and performances there was a round of speeches. Colleen Baublitz of UF SDS, speaking about the passage of SB 1400, which allows some undocumented students to pay instate tuition, said, “Students for a Democratic Society is proud to struggle alongside other groups for immigrants' rights in Florida. We are proud of our contributions in the fight for tuition equity, including the recent passage of HB851. SDS will continue to fight until every undocumented student has the same space and financial aid available to them as their peers." The event was a success as the Gainesville community celebrated the historic holiday.